All paints and glazes are food safe. Hand-made ceramics Long Handle Spoons，every one of these porcelain，The spoon is round and round, round and smooth, exquisite and durable. spoons is unique and not uniform to any other: some light and some dark. Chinese meals or Asian meals. You can use these serving spoons for multiple uses such as serving soup, porridge or appetizers with rice bowls or soup bowls at home. 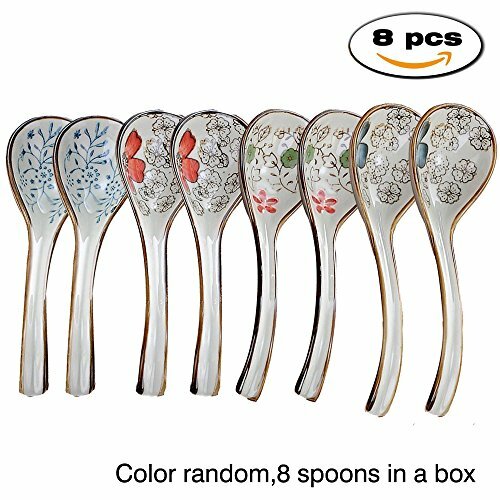 Elegant flower glaze on the Asian soup spoons delight you when you use them for soup, rice, porridge, cereal, appetizers, wonton, Tong sui, pho, udon, ramen and other noodles. STAR-TOP is a US registered trademark, We have our unique packaging and GREETING CARD.We didn't authorize any other seller to sell our products, if there is someone sell our products illegally, we will reserves the right to be investigated for responsibility. Please notice our package,We can offer 30-Day Money Back Guarantee; 24-hour on-line service;If you have any questions, please feel free to contact us, we promise to reply within 24 hours . Material:Ceramic,All glazes are food safe. Spoon size:Length 6.5 inch,width 1.9 inch,spoons fit right in the common Chinese characteristics.